Those inhabiting the worlds of rock and metal have never been shy of a good collaboration. From the sublime to the downright ridiculous (Ozzy and Miss Piggy, we're looking at you), a well-timed, well-placed collaboration can be enough to revive even the most waning of careers, or to open up an artist to a whole new generation of music-hungry fans. Here, we chronicle 30 of rock's very best collaborations. Beatle George’s (or L’Angelo Misterioso, as he was credited) spine-tingling, chiming guitar motif, ringing out before a wonderfully melodic Eric Clapton solo, is for most people the hook and the most memorable moment on Badge. Harrison also co-wrote, with Clapton, what was Cream’s most commercial and also their most enduring hit. Displaying the talent-spotting eye of Alex Ferguson and the business acumen of Jeff Bezos, Jacko poached the guitarist while the rest of Van Halen were out of town, extracted a fret-melting tapping solo, and didn’t even pay for his services. “Maybe he’ll give me dance lessons someday,” mused Eddie Van Halen. As far as we know, this return favour never came to pass. Landing Sir Elton John for the title-track of their comeback album was a bit of a coup for the grunge heroes. Jerry Cantrell recalled: “We got a call from our studio manager saying that Elton wanted to talk to us. We walked into the studio, where he was already recording.” His plaintive piano added another dimension to the band’s ode to fallen frontman Layne Staley. A smash hit ballad from the album Lita. “I grew up listening to Black Sabbath. The first concert I ever attended was Black Sabbath. I was just 13 years old – it changed my life!” recalled Lita Ford. “I just never dreamed that I would sing a duet with that very talented madman Ozzy.” Somehow the beauty and the beast pairing worked, and landed the duo a Number 8 single in the US. Male/female duets are often soppy and tender affairs, but Cher and Meat Loaf defy those rules with aplomb on the uptempo Dead Ringer….The video for this Jim Steinman-written anthem, featuring Meat and Cher flirting outrageously in Walt’s Inn, a bar full of softball fans, has quite rightly passed into rock folklore. Who could forget Cher’s portrayal of a dusky, gum-chewing, leather-clad badass, or blame Meat for accepting her offer and grabbing his coat? Inspired by a Jackson 5 song with a title suggested by John Lennon, this could have been a mongrel track from the Young Americans album. In fact, it’s a white soul/rock classic, and even if Lennon’s contribution was minimal, it’s integral – he sings the title over and over, and had a small lyrical input. Say what you like about Michael Jackson, but you’ve gotta hand it to the fella: he knew how to pick a guitar player to collaborate with. The normally unflappable Slash needed a sit-down when Jacko rang for 1991’s Dangerous (“I was star-struck… that feeling of, I guess I’ve arrived”). All the cool kids were listening to Nevermind by now, but everyone sought out Give In To Me, gave kudos to its stalking grooves, played air guitar to the climactic blues solo, and forgot all about the oxygen tents, chimpanzees and facial subsidence. Kerry King can be heard on the outro of this track from Pantera’s final album Reinventing The Steel. Says the Slayer guitarist: “Apart from the fact that I know, and love, these guys, I did it because Pantera always said they were influenced by Slayer. That was cool.” It certainly was – his riff-razing turn enhanced an already ferocious song. Found on Pink Floyd’s Wish You Were Here album, this is one of two songs in their career where an outsider does lead vocals; the other is The Great Gig In The Sky. Harper volunteered to take over when songwriter Roger Waters strained his voice, and David Gilmour refused to do it. The result has become a legendary footnote in two extraordinary careers. Taken from the one-off, self-titled Temple Of The Dog album, Hunger Strike features a duet between two great singers of the grunge era, and was the track that introduced Eddie Vedder to the rock world. Chris Cornell was having trouble with the vocals when Vedder stepped in and saved the day. “He sang half of that song not knowing that I’d wanted the part to be there, exactly the way I was thinking about doing it,” remembers Cornell. The funky groove of David Bowie’s Let’s Dance (from the album of the same title) was no doubt down to the influence of its producer, Chic’s main man, Nile Rodgers, but it was the amazing guitar solo from Stevie Ray Vaughan that lifted it into the realms of genius. It was a major break for the late guitarist, and Bowie was so impressed he asked Vaughan to tour with him. The latter declined, despite the fact that at the time he was having to drive trucks to finance his own musical ambitions. The Wildhearts had wanted ex-Bowie’s Spiders From Mars/Mott The Hoople guitarist icon Mick Ronson to produce their debut album, Earth Vs The Wildhearts, but sadly it was prevented by his deteriorating health. However, Ronson did manage record a guitar solo for …Headfuck shortly before his untimely death in April 1993. The song remains one of Ginger and co’s finest moments. Slayer guitarist Kerry King was brought in to give this song (from the Beastie Boys’ album Licensed To Ill) some serious metal energy. “We just knew that this needed a real metal solo,” says Licensed… producer Rick Rubin. “And who better to come in than Kerry? 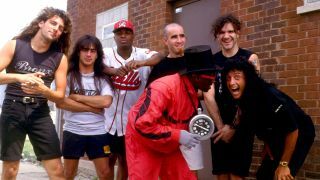 I was working with Slayer at the time.” Rubin’s golden touch did the business and the Beasties had a monster hit (and a great song under their belts). This song, one of a pair from Gary Moore’s Run For Cover album to feature Phil Lynott, was recorded two years after Thin Lizzy’s dissolution and is one of the last significant recordings made by Phil before his death. Addressing the Northern Ireland conflict, its hi-tech sounds became a huge hit. Oh, to have been a fly on the wall when Saxon and the future Sir Reg crossed paths at Wisseloord Studios in Holland during the recording of the latter’s Rock The Nations album, Elton agreeing to guest on a ditty that goes: ‘There’s people drinking gasoline/It must be two hundred proof’. Awesome. Released under the moniker ‘Headgirl’, Please Don’t Touch was a track on the St Valentine’s Day Massacre EP, on which Motörhead also covered Girlschool’s Emergency and the ’School girls did likewise to Motörhead’s Bomber. But it was the superb collaboration on this old Johnny Kidd & The Pirates’ song that captured our attention. Originally on the Page & Plant album Walking Into Clarksdale, this collaboration was featured on Plant & Krauss’s chart-busting Raising Sand. “It’s about yearning for someone, having unfinished business. There’s nothing rock’n’roll about it,” says Plant. Well, we beg to differ, and Krauss’s input elevates an already good song into a great one. Influential – but underused – Glaswegian hard rock vocalist Frankie Miller duetted with Philip Lynott on this version of Thin Lizzy’s greatest love song, which first appeared on the Nightlife album. Brian Robertson refused to re-record a guitar solo performed by his predecessor Gary Moore on the grounds it could not be surpassed. This collaboration is shrouded in mystery. Even Mann is unsure how it came about: “They called me up and I went to Toronto. I never found out why they chose me specifically. I just did as I was told.” Still, the results – Rush’s highbrow commerciality tempered by Mann’s delightfully wistful vocals – are stunning. This chart-topping collaboration came about almost by accident. Bowie had agreed to sing backing vocals on the song Cool Cat but didn’t like the final results. So he and Queen jammed something new and came up with this instead. Easy, innit?! There’s no missing the inimitable tones of Chrissie Hynde on her duet with Robin Zander on Walk Away, a song the Pretenders frontwoman also co-wrote. Cheap Trick’s Busted album includes more special guests including Foreigner’s Mick Jones and Russell Mael from Sparks. Eric Clapton would later take George Harrison’s hospitality too far by pinching his wife, but he’s the perfect house guest on this White Album highlight, getting the bickering Fabs to pull together while turning in a swooping double-tracked solo. Fact: Clapton is the only outsider ever to play guitar on a Beatles record. Producer Jimmy Iovine strikes again! Stop Draggin' My Heart Around was written by Petty and Mike Campbell for the Tom Petty & The Heartbreakers album Hard Promises. But Jimmy Iovine, who produced both that and Stevie Nicks’ debut solo LP Bella Donna, thought it suited Nicks’ record better. So, it was switched, with Petty and the Heartbreakers playing on it.